One of the things I remember strongly from the game was this idea of bartering. If someone didn’t have money, they could trade some of their goods or services for someone else’s goods or services. This really resonated with me, especially since I have always been passionate about building a community and sharing with other. So, it stands to reason that when I got out of theater school, I started to think: as actors and business owners, bartering might be a great part of getting the things we need for a successful career. Imagine, if you created the right kinds of relationships and developed a much needed skill set, you could trade for the goods and services you desperately need for your career. No more, “Well, I would but I don’t have the money”… you would be able to trade for everything you needed. So, how does one do this? 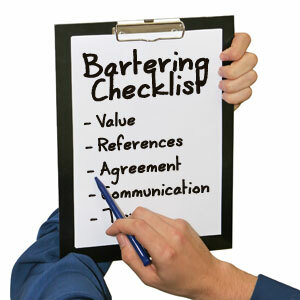 Well, there are several different things you have to consider when thinking about using bartering for your business. What kinds of things would you like to trade for? In order to be able to barter, you have to have a good or service that you can trade that is relevant for the person you’re trading with. I started by examining my relationships to find where bartering might be most useful. For many actors, this can simply mean offering your time to someone for a task they desperately need support with, or it can also mean utilizing a skill set that is unique and desired by others. Make a list by coming up with a group of skills or services that you excel at, and that you’d be willing to barter. Do you have an administrative skill that you could offer – for example, are you great on the computer, or are you good at organizing? Does your day job equip you with a skill that you could offer to someone in exchange for another service? Sometimes, though, it’s simply that you have time on your hands that you can offer to someone. My voice teacher has a young child, and I know that childcare is something she’s often interested in bartering for. If you have an interest in children, this might be a skill you’d add to your list. Once you have a list of skills, and you know what kind of services you’re interested in receiving, it’s time to match the two together. Come up with some ideas about how to help each particular service provider with a skill you have to offer. For example, let’s say that you are skilled at graphic design and HTML coding, and you notice that your hairstylist doesn’t have a website. Based on this knowledge, you could offer to build a site in exchange for styling services of the same value. You’d be providing a valuable service while receiving your own valuable service in return, thereby freeing up your cash for other important purposes. Years ago when I first discovered bartering, I talked to my voice teacher about trading so that I could get extra lessons. We came up with a plan for me to be a dog walker when she went out of town, as well some administrative work. One example of admin work I did: I spent hours creating a spreadsheet for all of the Los Angeles casting directors and agents listed in The Call Sheet (called Ross Reports, at that time), which she could then use to make labels. For every 4 hours of admin work I did, I received 1 hour of a voice lesson. If you’re having trouble coming up with skills that are relevant to the service you want to barter for, all you have to do is ask. Talk to the service provider, and let them know that you’re looking for innovative ways to be able to afford the services you need. Give them a list of things you’re good at, and ask them if there is anything they might find valuable in trade for the services they provide. The worst thing that could happen? They could say no, and then you’re in the same position you’re in now. But if they say yes, you’ll now have the opportunity to build a constructive relationship with another business owner and save yourself some valuable dough. Be advised: not all business owners are equipped to handle bartering, so be sure to be respectful if they say no. Each person knows their business better than anyone else, so only they can decide if bartering is useful to them. Remember that we all depend on our business income for our livelihood, so sometimes cold hard cash is more important than getting services for free. I’m convinced that if you do your homework, you will find someone (or multiple someones) that will be interested in what you have to offer. I contacted Nance Schick, an employment attorney for small business owners, to get her thoughts on bartering (which she does quite a bit.) She reminded me that when bartering, you need to make sure that you keep invoices/receipts that show the exact value of the barter. Even more important, make sure that the bartered services are for equal value, so that there is a zero balance in the end. You do this, because the government will tax you if a service you receive has more highly valued than the one you provided. For example, if you did a website design for $500, but you received a $600 demo reel in exchange, you would be taxed on the $100 overage. To combat this, make sure you do the same value of work that the other service provider does, and then create an invoice that reflects that. In the above example, I would do a little extra work on the website package so that the value is $600, and then show that the web design was paid for with a $600 demo reel package. Make sure you both have invoices on file reflecting the trade. You might remember my example above where I did 4 hours of admin work in exchange for 1 hour of coaching? The way we worked out that barter agreement was to estimate the admin work to be worth $15 per hour, and her coaching to be worth $60 per hour. So, on my invoice I showed that for each trade I worked 4 hours at $15 per hour, and as payment I received $60 in coaching services. These kinds of invoices should be sufficient to show that the bartering was fair and equal. If you have any questions, it would be a good idea to talk to a lawyer or an accountant when setting up your bartering services. You can check out the IRS Website for tax advice as well. You can also leave your questions in the comments section below, and I’ll answer them in any way I can. I have tons of experience in bartering — I currently barter for voice lessons, piano accompaniment, life coaching, massage therapy, acting coaching, dance lessons, and will soon be trading for facial/spa service and personal training. I feel like I’ve won the lottery! I offer child care and in return parents pay towards portions of my household bills Is this so e thing I can do and call it bartered exchange. If so how can I do this while claim g taxes on it?